French for "green beans," Haricots Verts refers to a longer, thinner type of green bean than the typical American green bean. Garlic, olive oil, salt and pepper is all you need to bring out the best flavor in this dish. 30 calories. Preheat oven to 425°. 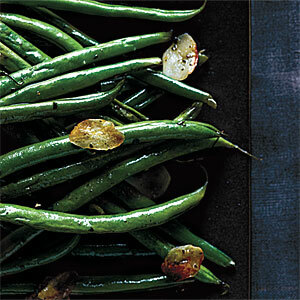 Combine olive oil, salt, pepper, garlic, and haricots verts on a baking sheet, and toss to coat. Bake at 425° for 15 minutes or until tender, stirring once.